Now keep in mind that older houses make noises, explains my mom. They creak and moan, but it's just the sounds of the house settling. I don't want you to get scared when you hear weird things. We nod at this new information. My sister and I were at the terribly impressionable ages of eight and nine, my brother just a babe in arms, when we were plucked from our cozy ranch house in the 'burbs. After moving from one platted neighborhood to the next, and changing schools three times, the rents had bought a small farm in the country. A few furrowed acres of neighbor buffer, a rutted gravel lane and the pre-civil war farmhouse that became our final childhood home. The house was indeed aged. Built up from the original rough hewn log cabin, it was two stories of living space with a dirt floor cellar. 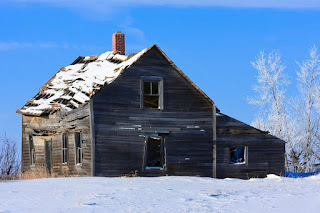 Questionable fuse-style wiring brought us electrical power and we relied on the wood stove in the kitchen as our primary heat source in the winter months. The outhouse was a two-seater affair, so we were livin' large there. Ok, ok, it wasn't this bad. And yeah, those creaks and moans. Like the old house was arthritic with its knees popping as it settled. And Mom's advise was only effective during daylight hours. In the dark of night with the nearest neighbor much further than a B-movie scream away, things could get a little creepy. My bedroom was upstairs and built directly over the log cabin. Even without a strong wind to help, sounds would come from the very walls like a mournful spirit, only to end their sad song with a sharp snapping noise. The hell with restless spirits, I think now as an adult. I realize now the flippin' house was probably just one "monkeys jumping on the bed" game away from imploding upon itself. I see the rocking chair across from my sleepy self and what? I blink hard. But no, there it is. A face in the chair. No outline of a body, but merely a man's face, middle-aged, weathered by the sun. Dark eyes fixed on me. Was he watching me sleep? I can actually see the painted design of the back of the rocking chair behind this apparition. Remember when you were little and scared of monsters under the bed? Did you ever hold yourself real still and think if you don't move a muscle the monster will either not know you're there, or if it does know, it will think you're maybe already dead? And Monster Code dictates that there's no glory in menacing dead folk, so you're completely safe, right? Ok, that same coping skill works for see-through ghost heads in rocking chairs. I slammed my eyes shut so tight I saw stars. One-Mississippi, Two-Mississippi . . . how long does one wait for a ghost to disappear? There's a fire alarm blaring a red alert in my panicked noggin. What seemed like thirty minutes, but was more likely fifteen seconds, I squinted one eye open to look again. And it's gone. Good thing too, because by then I needed to use the bathroom something bad. I know, I know. The imagination is a powerful thing. And I was just a kid. The story is true and based on my memory, so much so that I could describe the image right down to the deep lines in its forehead. But you know, back then I loved to read the creepy comic books of the '70's like The Witching Hour and Eerie. So yeah, my brain is hard-wired to enjoy a stroll on the creepy side of things. I might have even been tempted to go the Goth route back then, but Gold Circle didn't have have that kind of cutting edge fashion. So I agree, this close encounter with the spiritual realm was all likely a remnant of a child's waking dream. 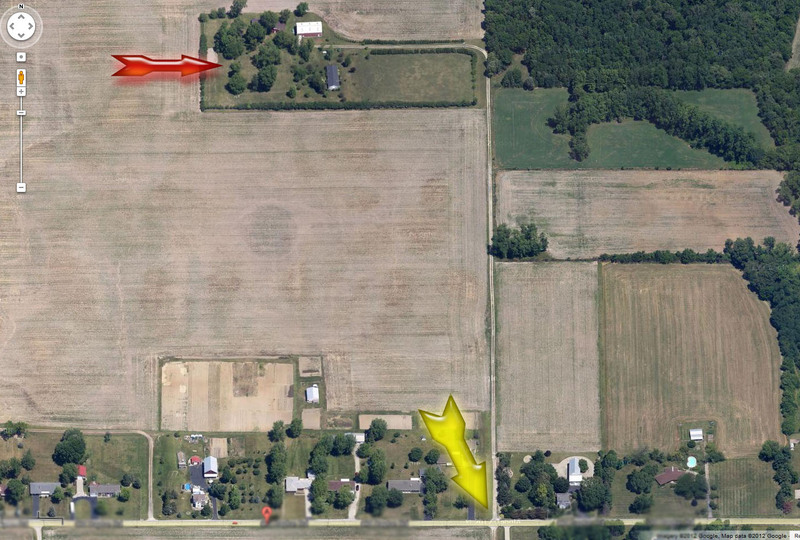 The red arrow is where the house once stood. The yellow arrow is the nearest road. A quarter mile of gravel lane separates the two arrows. Take a moment to appreciate the solitude, the privacy, the flippin' walk to catch the school bus.